You’ve probably noticed our 7 Day forecast is much colder than 48 hours ago. 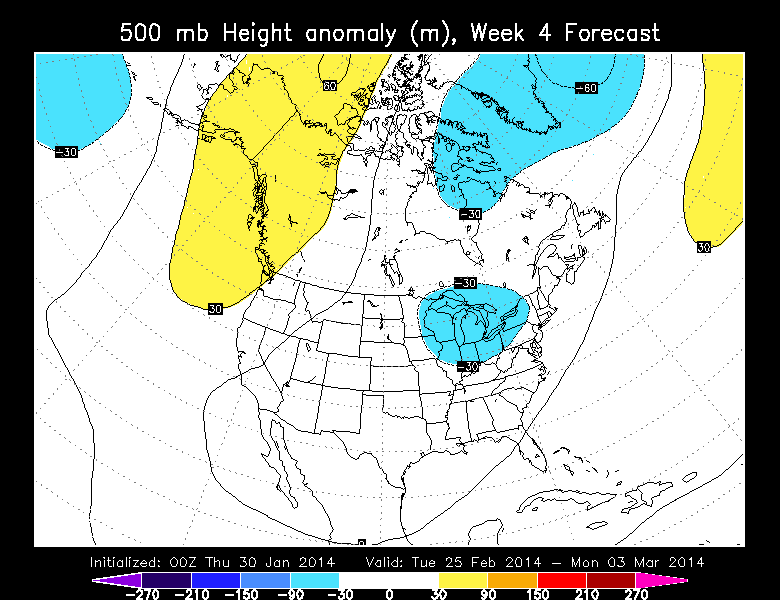 That’s because a cold airmass will gradually work south out of Canada Monday through Wednesday of next week. There is no “storm” or “system” coming. It’s just an increased flow of cold and dry arctic air. For that matter it’s not a polar vortex either; in case you were wondering. 2. A few showers of either rain or snow are possible between Sunday night and Monday night. At this point it appears there may not be much of anything, so most of us will likely stay dry. 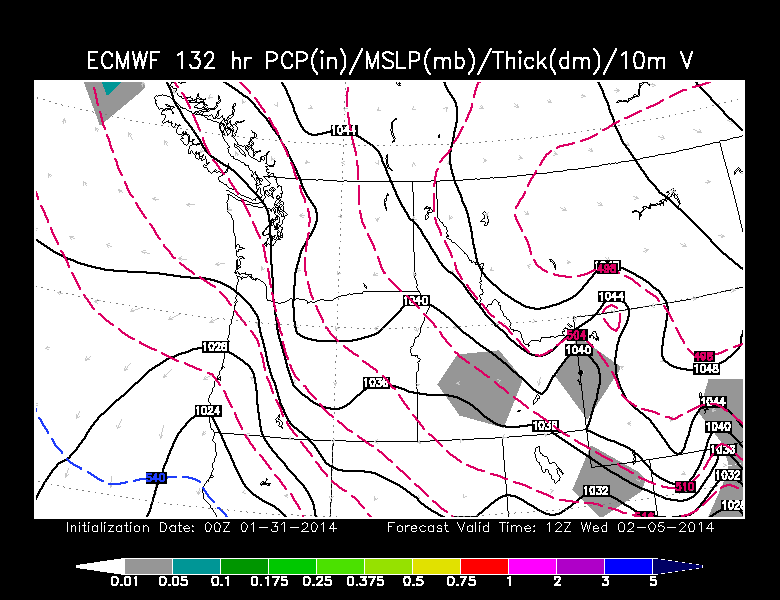 I don’t see a good setup for a decent snowfall in the lowlands west of the Cascades. 3. 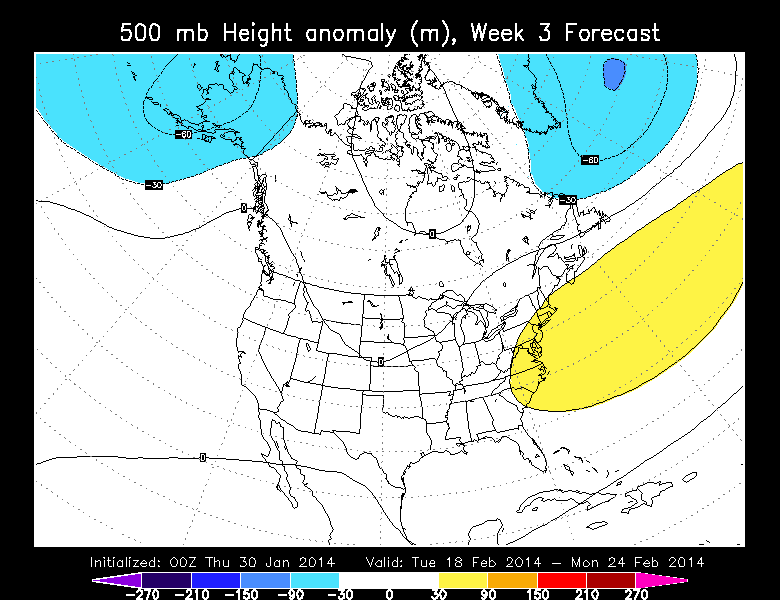 Cold east wind starts blowing late Monday and reaches a peak Thursday or so. This will be the coldest and strongest east wind (the two together) we’ve seen all winter. 4. 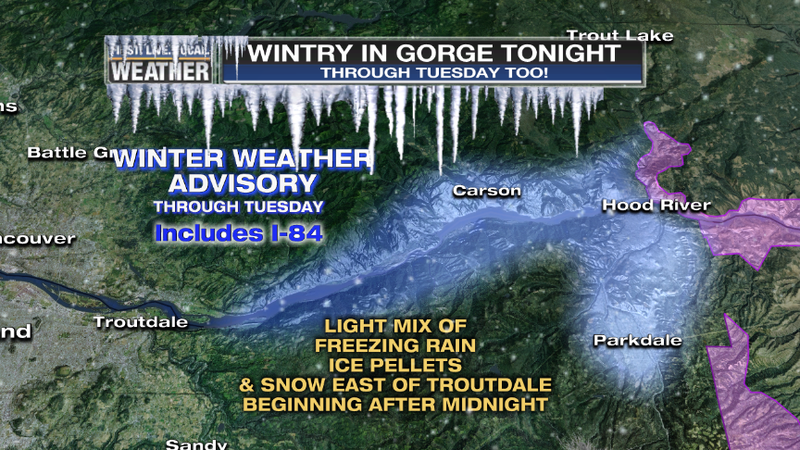 We’re talking high temps around 30 or even colder in Portland, and 20-25 in the Gorge! Not quite as cold as December’s arctic blast, but close. Note the -12 or so over Portland, and -20 over The Dalles! Those are similar numbers to the December cold spell. 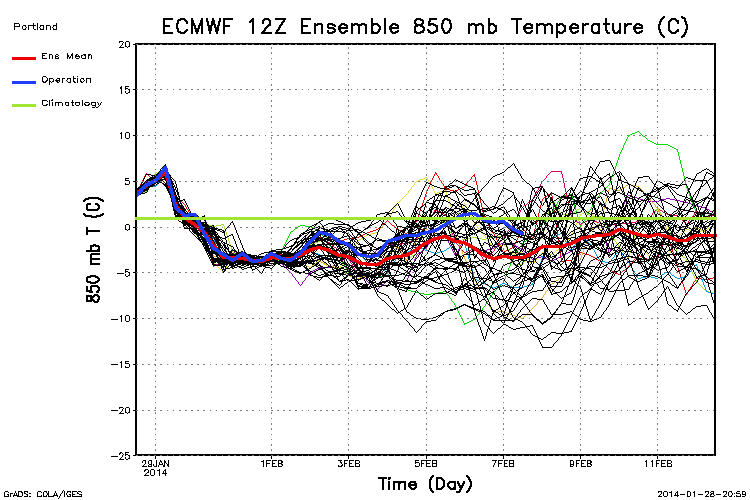 Of course that’s a model forecast, not what has actually occurred yet. 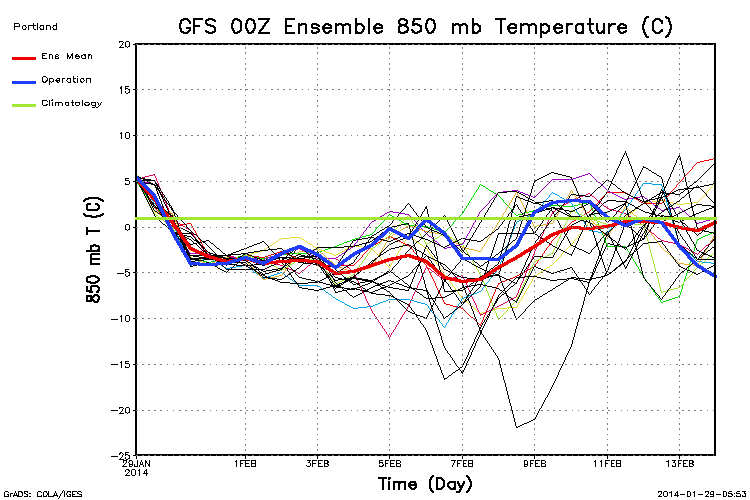 But we’re seeing some good consistency in the models; they are all calling for a good cold spell. It’s just a matter of “how cold?”. That’s why we dropped the 7 day forecast numbers down so far. By the way, -20 would equal a high temperature around ZERO at 5,000′ in the Cascades around Mt. Hood. Yes, this could be one of those times where we get single digits and strong gusty wind up on the mountain! It shows the operational run was a little on the cold side, but even the average was around a -11 or so by Thursday morning. 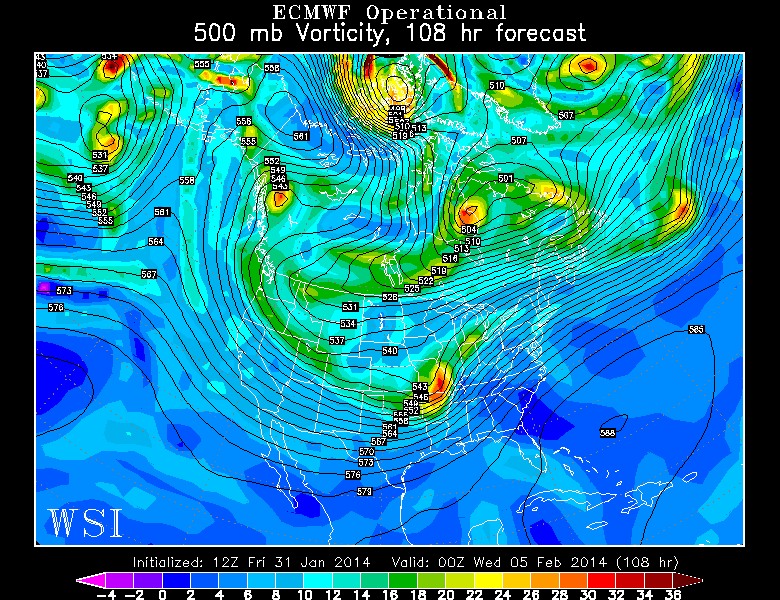 Models also show the wettest set of weather systems we’ve seen in 3 weeks arriving beginning NEXT weekend. 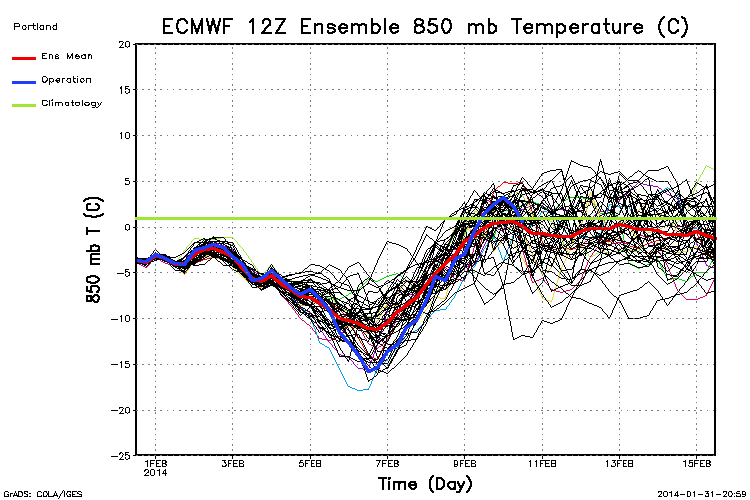 Of course that means there maybe be some sort of “transition event” at that time, but that’s still 8+ days away. 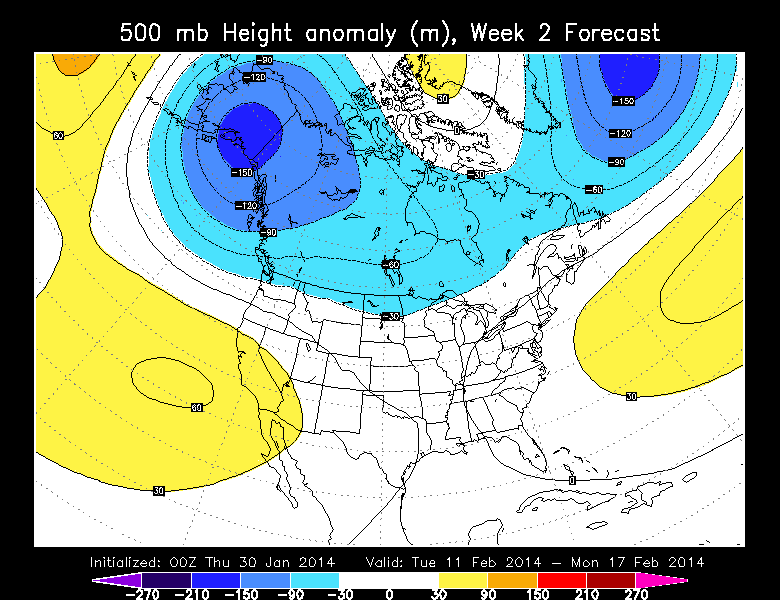 We may have the first widespread cold period since mid December coming for next week across the Pacific Northwest. Models have been advertising a cool northerly flow for next week for quite a few days, and there have been hints of an “arctic intrusion” of some sort too. What’s the difference between that and an arctic blast? Not sure, but it doesn’t look nearly as cold as what we saw back in December. And this time, as of tonight at least, there doesn’t appear to be any moisture associated with the cooler air for snow. I lowered the 7Day forecast high temps into the 30s as a result. If it was November or December and it hadn’t been cold yet this season, I’d say it’s time to wrap the pipes etc… But we’re still in winter and there’s nothing to “prepare for”. They both seem to be a little on the cold side; the blue lines are the operational runs we get the maps and output from. The red is the average of all the ensemble members. There is a clear signal that once we get to about next weekend we go to a wetter westerly flow and temps back around normal. Since it’ll be mid-February by that time, my gut feeling then is that next week will be the last chance for a many-days-long cold spell this season. 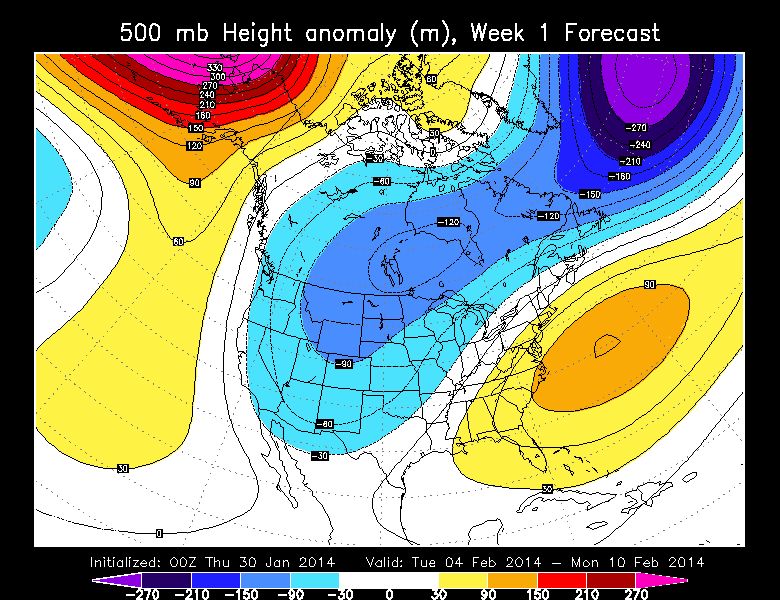 Other than the impending colder weather, the theme for this winter remains the same for the next 8+ days…DRY. Now we have a very warm flow of air coming in from the southwest and that will continue through tomorrow afternoon. With surface low pressure passing by to the north, we should see a southerly breeze developing later tonight for most of the valleys west of the Cascades. The result will be temps in the 50s! Enjoy, because then we’ll turn chilly for the next 7-10 days. Probably not COLD, but just cool with snow levels between 1,500′ and 3,000′ until further notice. 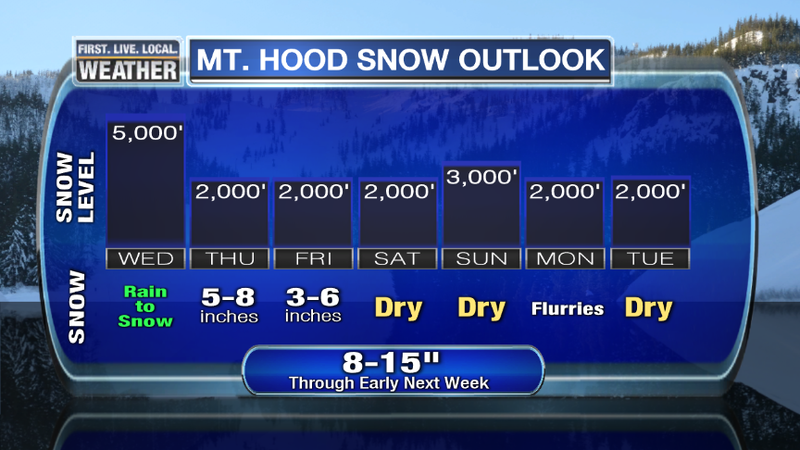 The bad news is that we just have one dumping of snow the next 48 hours and then it’ll be mainly dry for the following week. I’d avoid skiing tomorrow and go for Thursday and Friday as a result. Here in the lowlands our weather will remain quite dull over the next week as high pressure pushes a bit farther offshore and we get into a split flow jet stream pattern. Or a ridge just to our west. Either way, not a whole lot of anything happening. 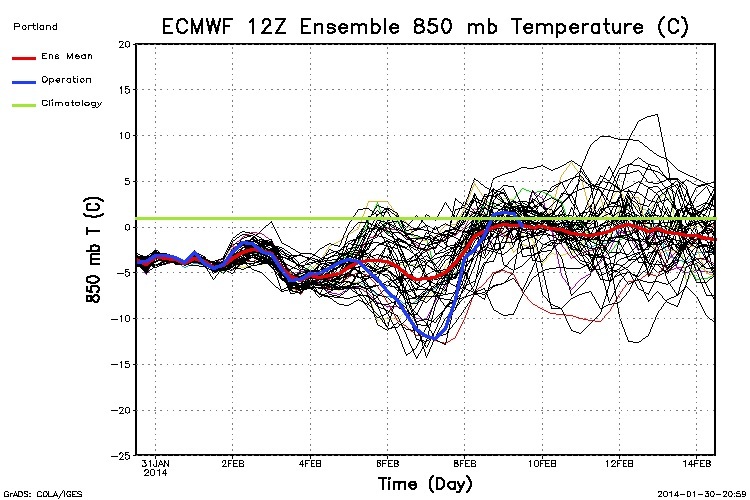 Of course there are plenty of cold members and quite a bit of uncertainty. 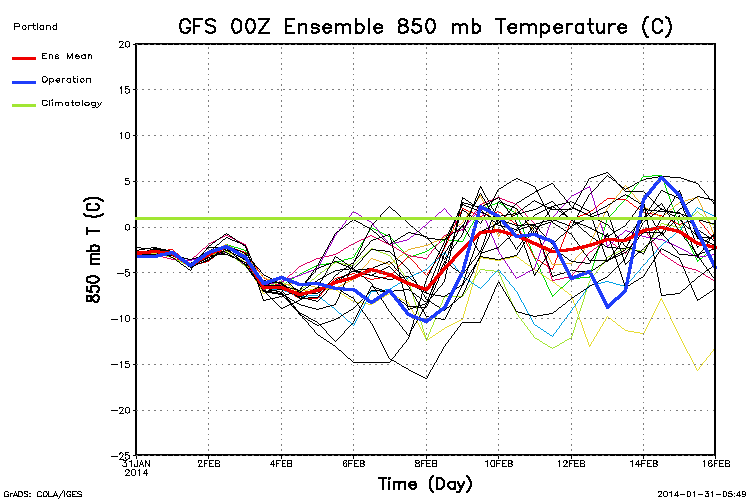 The 00z GFS operational model is a warm outlier, but not outside the range of possibilities. The new 00z ECMWF is very similar (no chart yet), showing a very splitty and weak flow through an upper-level ridge offshore next week. Take a look at Day 10…that’s some weak sauce! In fact this latest run has no rain in most of Oregon for 7 days again beginning this Friday afternoon. I mentioned on a FB posting on Friday that I might try hiking from Women’s Forum viewpoint over to Crown Point on Saturday because everything is dry and/or frozen. I did it, it was a ton of work, and I won’t do it again. First, I don’t recommend anyone else waste their time because there is no trail (I knew that), and it’s pretty steep near the top. And in muddy conditions it would be dangerous. So where did I go? 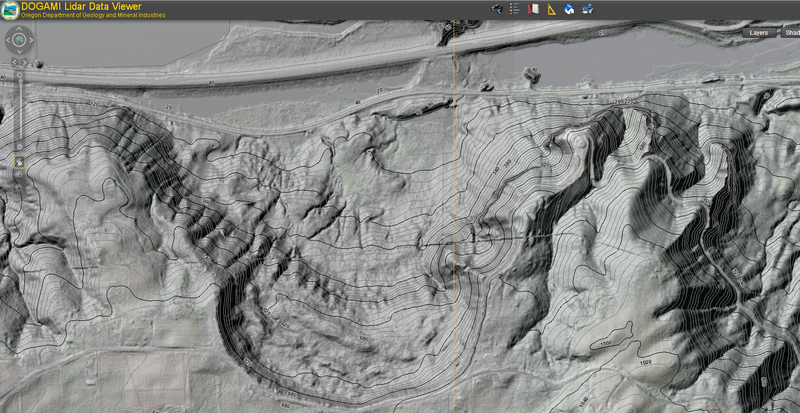 Take a look at the map from the DOGAMI lidar viewer page. Can you see the old road that once went from the train tracks at Rooster Rock to Women’s Forum State Park? Parts of it are visible on the first map. 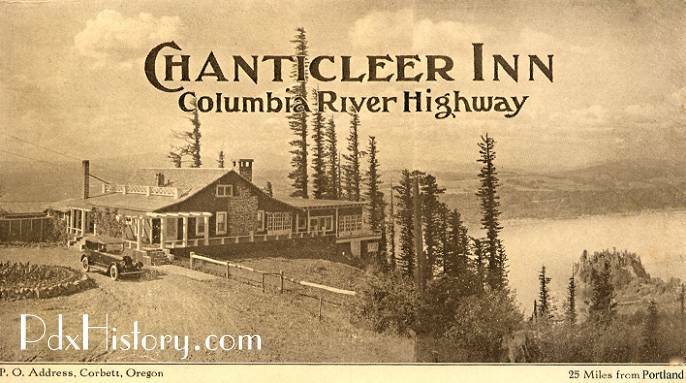 Women’s Forum used to be called Chanticleer Point and there was a famous restaurant there. 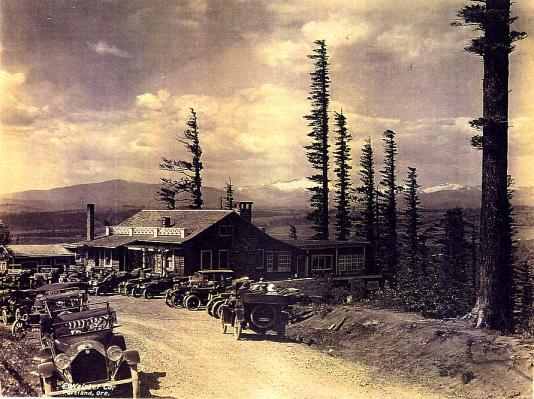 People would take the train from Portland, get off, and get a ride up to the top for a nice dinner. Now here is the route I took in red, which is the old road, now just a trail in spots. 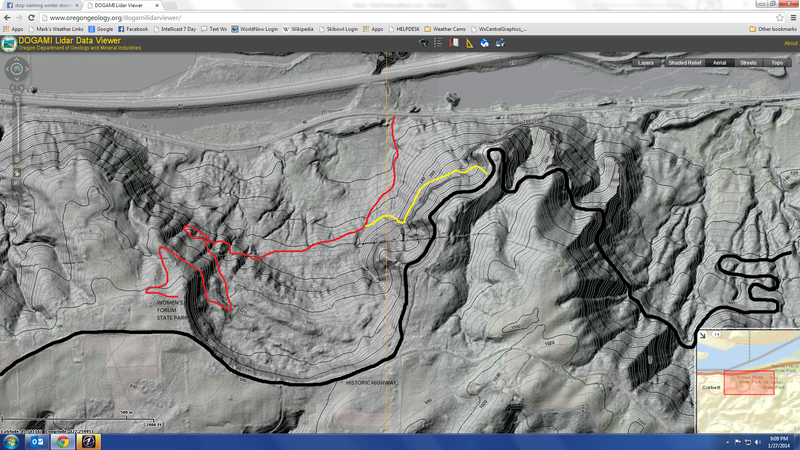 The yellow shows where I left the trail and headed uphill (bushwacking) until I got close to cliffs. There is only one gap between the cliffs where you can climb straight up towards Vista House. I went through there and that’s where it gets real steep. Halfway to the top you suddenly come across a “debris field” of junk that has either blown down or slid down the hill. The surprise was that I found almost nothing of value; a few interesting things though. A picnic table, a license plate from the late 1980s, someone’s prescription for some interesting medications, and two pickup canopy covers. Those last two had been there awhile and were not from the past week; not sure where those go. I never saw a single hat or pair of sunglasses. And, it’s totally calm until the last few feet, then you get blasted as you come up into the parking area. Once again, a fun little adventure but I wouldn’t do it again. 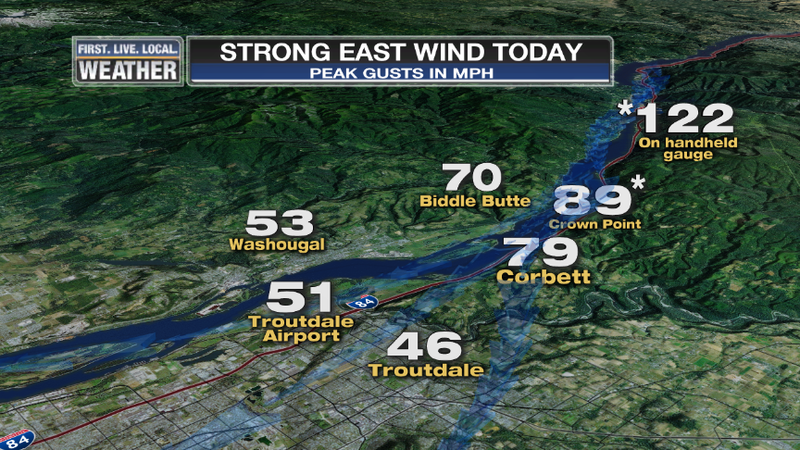 We’ve seen east wind blowing through the Columbia River Gorge most of the past week. Now a cold airmass is sitting below about 1,500′ at the west end of the Gorge and 4,000′ at the east end. The air moving in overhead has a freezing level around 8,000′! As a result, a mix of freezing rain at the west end of the Gorge and freezing rain, ice pellets, and snow will fall once precipitation arrives later tonight. It won’t be a lot, but just a few minutes of freezing rain can make I-84 an icy mess. There will be no switch to a warming westerly wind tomorrow, which means temps will only climb a notch or two above freezing. 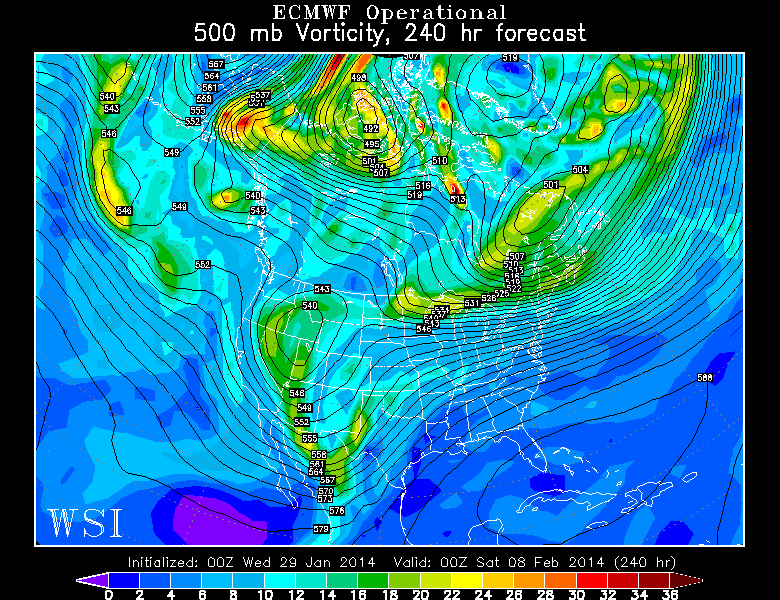 The good news is that the wind should turn gusty westerly on Wednesday, so temps may jump to around 50 at that time. Here in the metro area we sure had a gray day today! Quite a change from the bright sunshine over the past few weeks. I don’t see a whole lot of rain coming up, maybe 1/2″ to 3/4″ before we dry out Thursday morning. Still, we’ll take what we can get since it’s been such a dry winter! A Rough Day In The Gorge: 122 mph! Looks to me that the Troutdale speed is the highest since 2009, and Biddle Butte is the highest since that sensor has been online. That’s maybe 3 years there. 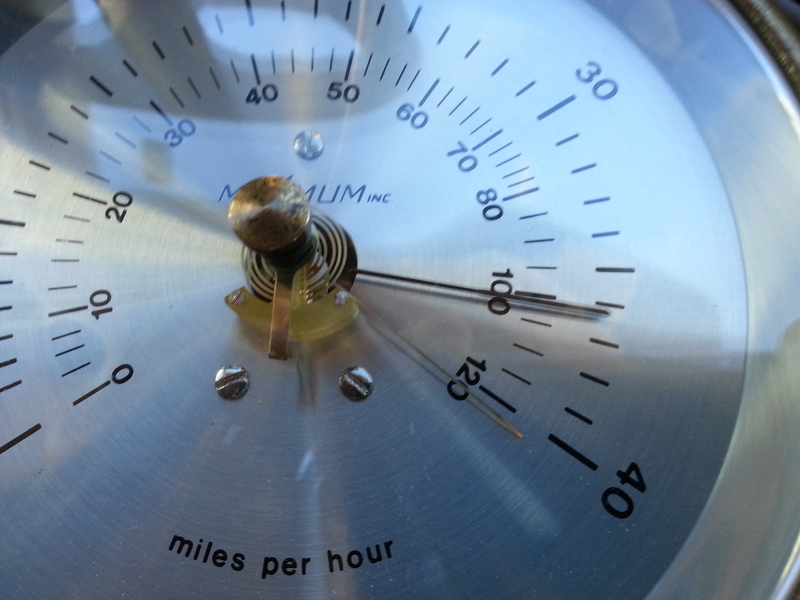 The pressure gradient between The Dalles and Portland got up to around 11 millibars, a huge drop in pressure from eastside to westside allowed the air to accelerate down the west end of the Gorge and really nail Vista House. 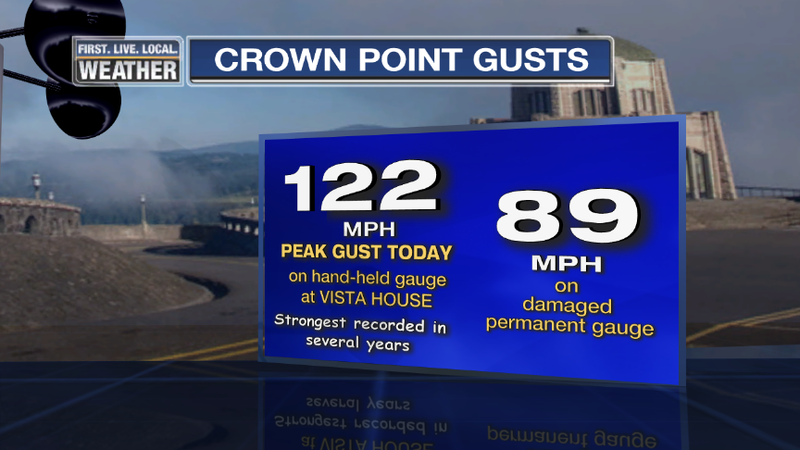 The 122 mph gust showed up on Matt Sloan’s Maximum anemometer. You’ll notice it’s pegged at the top too, the scale doesn’t go any higher. In fact I think that’s the same model I purchased with my hard-earned money around 1985 in high school. $350 was a lot of money back then! Here are the real “damage” videos today, courtesy YouTube, Tyler Mode and Tim McGarry. On this one you’ll notice a woman get knocked into the road (face down) at :30 or so. Ouch, that’s got to hurt! Our photographer out there today saw 3 car doors break, and one tonneau cover get ripped off by the wind. That’s after Brian MacMillan saw a truck canopy fly off into the wind. There must be a lot of junk in the trees down below each spring! The pressure gradient will gradually decrease this weekend, allowing more reasonable windspeeds to return in the Gorge. In fact by Sunday the wind should be just breezy to light out there. You are currently browsing the FOX 12 Weather Blog blog archives for January, 2014.